Ideal for outdoor gardening and planting. Coordinates greatly with your outdoor living space. Made out of solid fir wood construction with durable hardware. Spacious work top capable of various garden tasks. 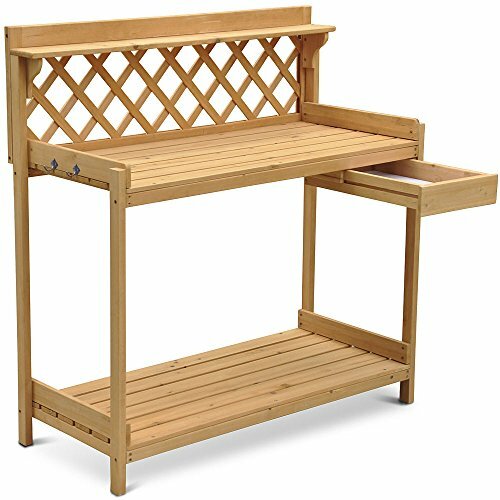 A lower open shelf for storing your potting tools or plants. Side drawer with durable PVC bottom for extra storage and two iron hooks on the one side for hanging. All hardware included; assembly takes about 30 minutes and requires a screwdriver. If you have any questions about this product by Tek Widget, contact us by completing and submitting the form below. If you are looking for a specif part number, please include it with your message.